2013 is drawing to a close, and I won’t be working Tuesday, so I thought you might like to see some numbers. Plus WordPress sent me the info so it was an easy posting! This blog was viewed about 2,100,000 times in 2013. The busiest month was this one, December 2013: 558,000 views. That is the 2nd highest month in the 8 year history of the FOX12 Weather Blog. I think the highest was around 600,000 in February 2012. Busiest day was December 9th with 62,000 hits. The top commenters of 2013? 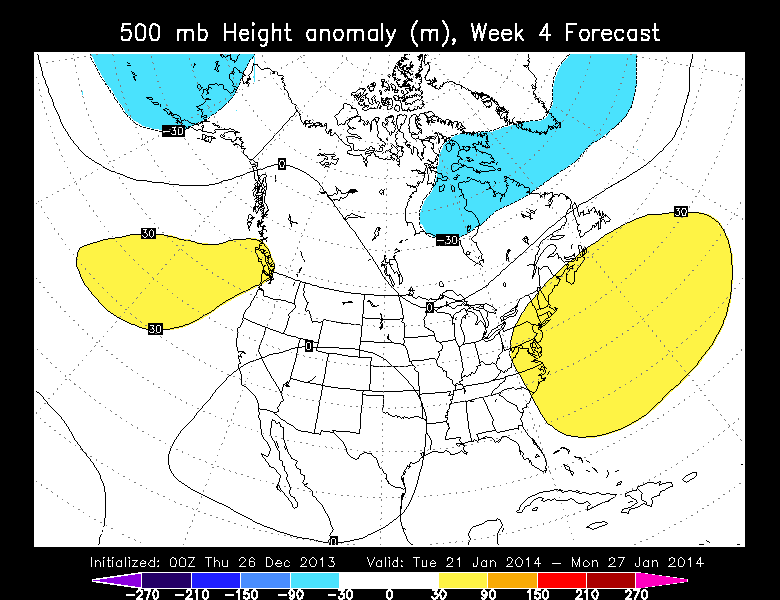 It’s Monday afternoon, which means another monthly run of the ECMWF from last night. 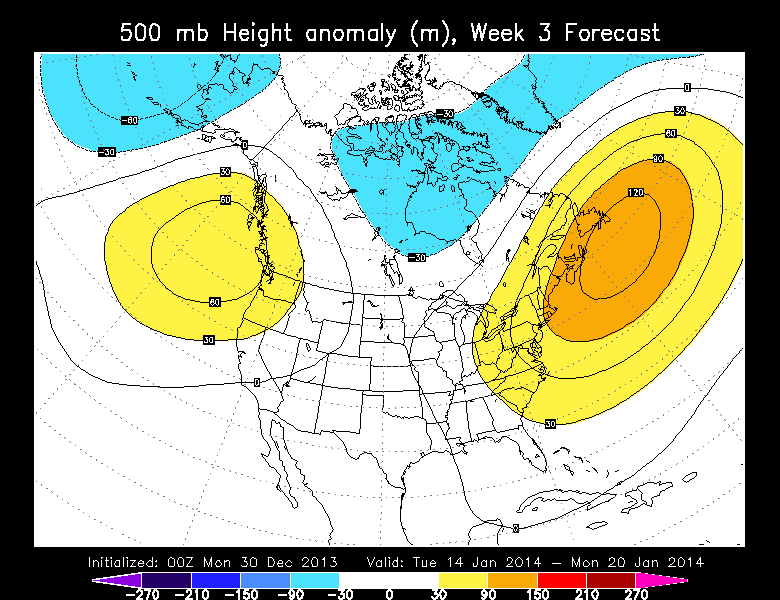 Same thing, some sort of ridging or mild westerly flow (week 2 only) for the next 4 weeks. How bad is the snow situation in the Oregon Cascades right now? The key part of the question is “RIGHT NOW”. 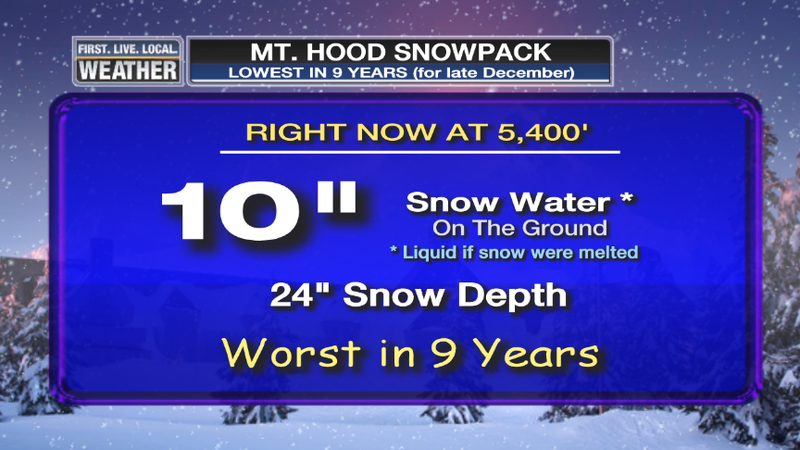 As of this moment, it’s the lowest snowpack we’ve seen on Mt. Hood on this date since late December 2004. That ended up being a terrible snow year in which the snowpack would try to build with weak systems delivering below average precipitation. Then 4 times that winter we saw pineapple express events (warm and flooding rains) wash away the snow. As I recall, there were weeks-long periods during January and February when even Mt. Hood Meadows had to close. At least we haven’t seen those warm rains for a few weeks. But still, as of this week, it is an especially bad ski season. That could easily change. Could it change? Definitely! Will it? We don’t know yet. The numbers above are from a SNOTEL site, operated by the Natural Resources Conservation Service (NRCS) at the 5,400′ level on Mt. Hood. It’s quite close to the bottom of the Pucci Lift at Timberline. By the way, SWE (snow water equivalent) is the water in the snowpack if it were suddenly melted. Basically “how much snow is in the bank”. In this case there is 24″ of snow on the ground, which if melted, would give the equivalent of 10″ of rain. To see how our current situation compares with past years, I went back and looked at the snowpack during the 4 other years in which we’ve seen less than 12″ SWE. 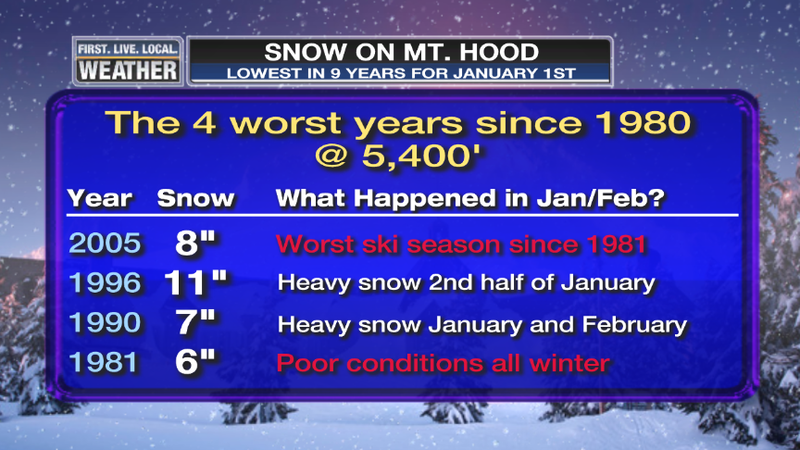 Yes, there have only been 4 years since 1980 that are this bad as of January 1st! I added in the horrible 1976-1977 drought year for kicks…wow. Through mid February there was never more than 25″ on the ground! We’ll see what happens. 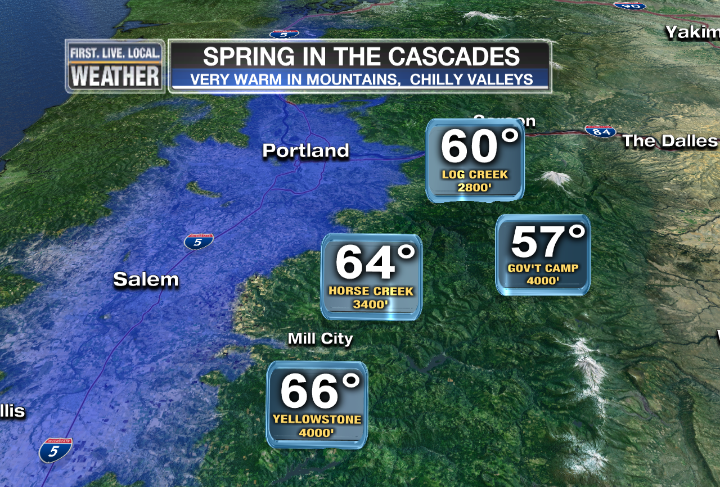 Definitely no snow in the Cascades through this coming Thursday. We should finally see at least a few inches next Friday and/or Saturday. 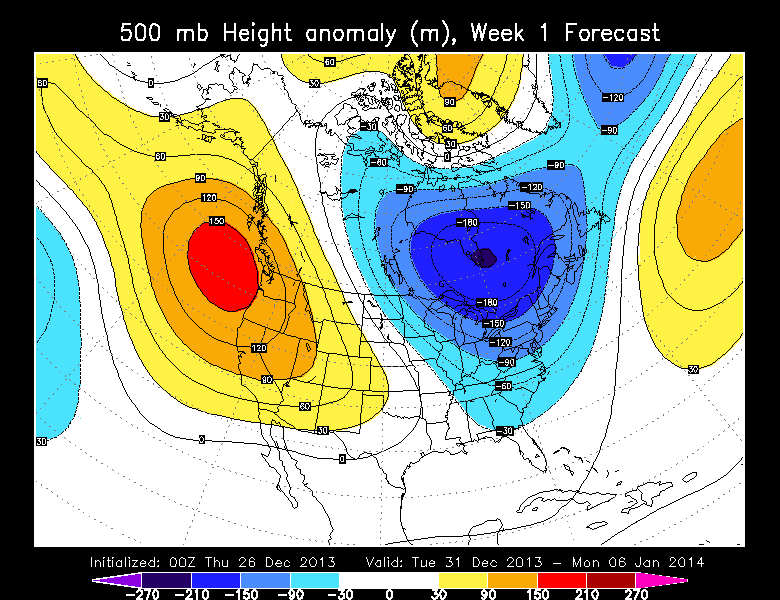 Then some huge disagreement on models. 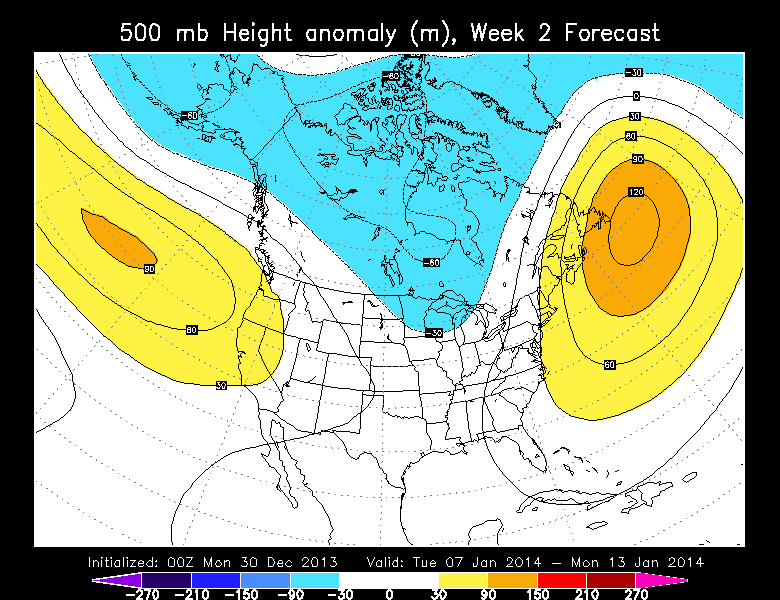 Some, like the 12z ECMWF, keep the upper level ridging nearby or over us for the next 10 days. Others (the trusty GFS!) 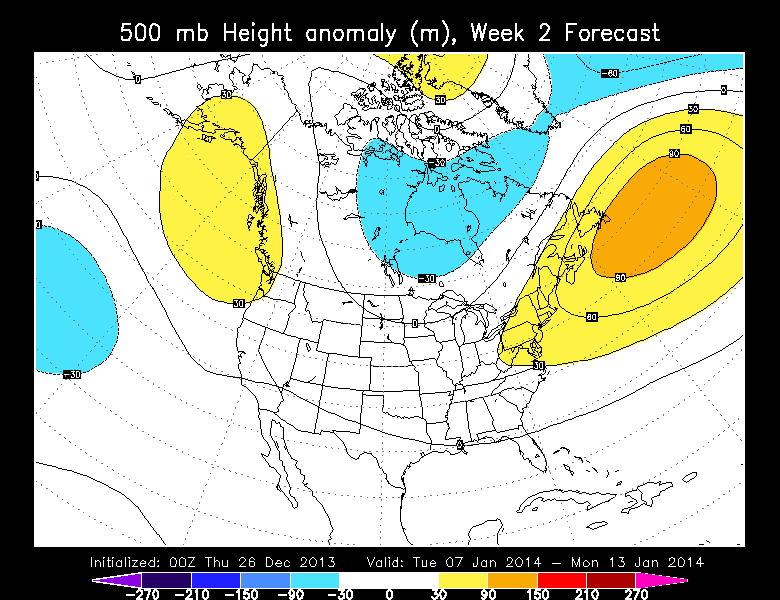 keep trying to push an arctic air mass south over us at some point beyond day 8. 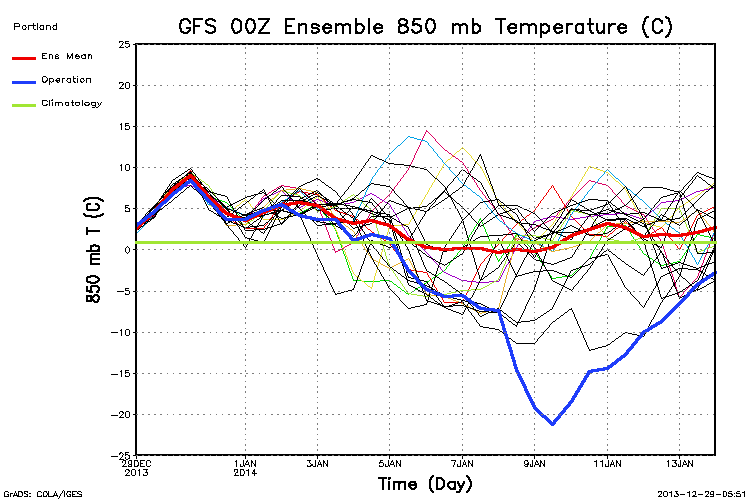 The new 00z GFS was insanely cold about 12 days from now. 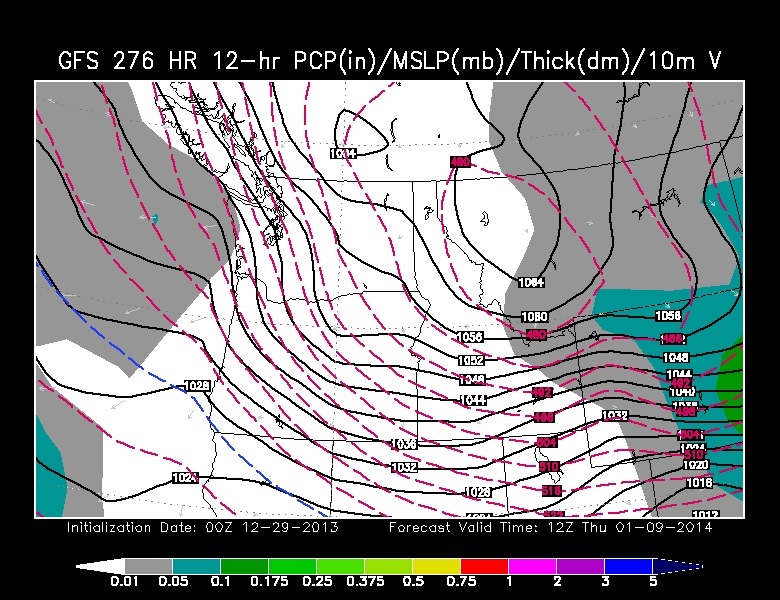 Here’s some eye candy showing a 1064mb surface high over southern British Columbia and the coldest arctic air I’ve seen forecast over eastern Washington and Oregon. Only 12 days away! Luckily the 00z ensemble chart, showing all the other versions of the same run, show this extremely cold solution to be all by itself. Note the blue line, which is the operational run you see above. It’s pretty obvious that we won’t get much rain in the next 5 days. A few showers are possible tomorrow afternoon and/or Monday/Tuesday. But that’s it. 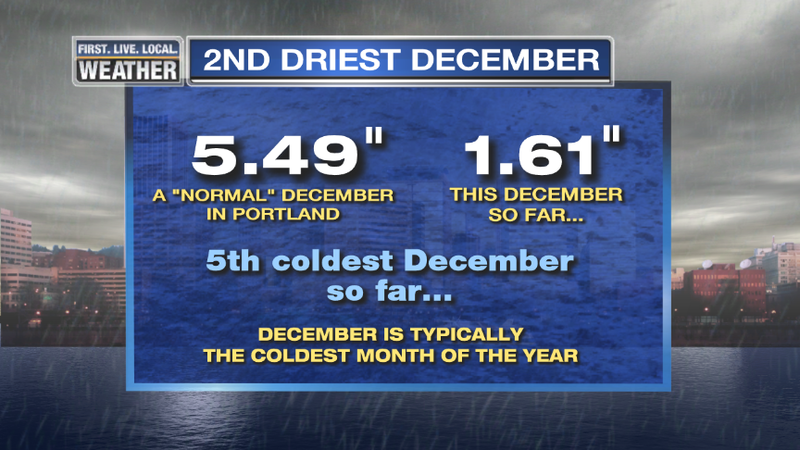 As of now, we’re running in 2nd place for December precipitation here in Portland. 1976-’77 was drier. A chilly month too! As of now it’s the coldest month in 4 years (Dec 2009 was slightly colder), and those two are the coldest since 1990. I was surprised some other months in the past 10-15 years haven’t been colder, but all those other years we saw a warmer spell at some point during the month. This year it was the arctic blast, then lots of inversion weather with very few days at/above 50 degrees to balance out the temps. Today was a classic winter inversion day in our region…50s and 60s in the mountains and mainly 30s in the western valleys under the fog and clouds. Notice everyone else below 1,000′ or so is stuck in the muck between the Coast and Cascade Ranges. 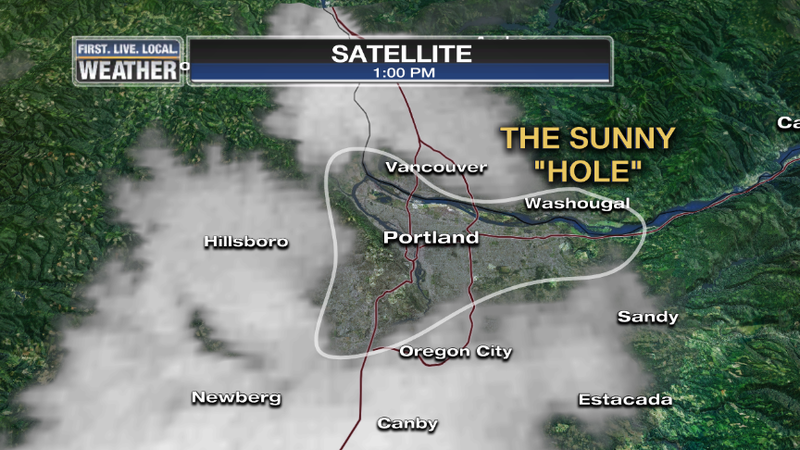 So please continue to enjoy the fog, sun, and even a few sprinkles! 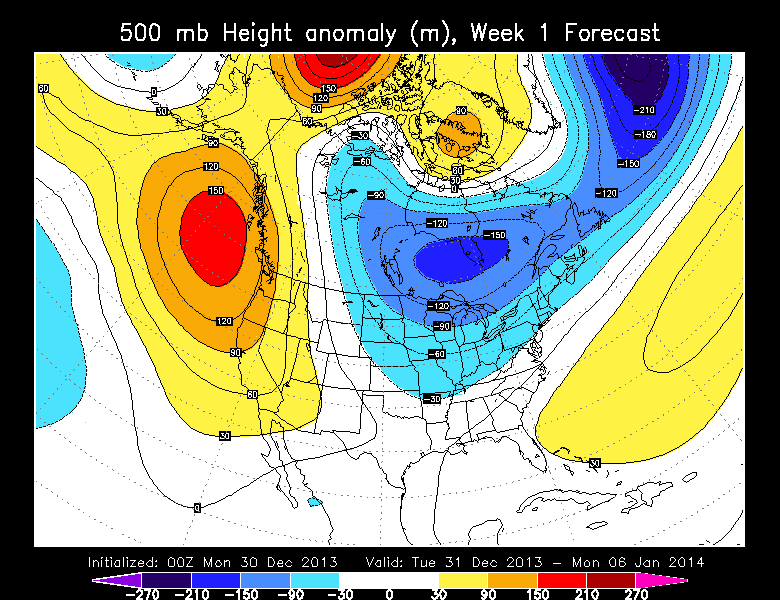 ECMWF Weekly Maps: Ridging Continues? Twice a week the ECMWF is run out to one month and we see an average of the 500mb heights for the week from all the ensemble members. I just looked at last night’s run. Of course you can never read too much into these maps, but sometimes they give us a general idea of what might be ahead. 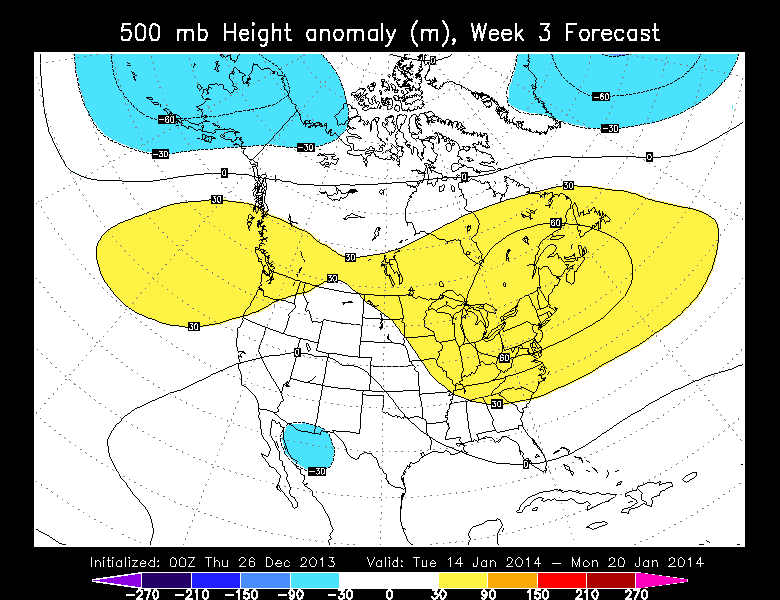 In this case it appears some sort of higher than normal heights (ridging) wants to stick around through at least mid January. We’ll see. This is turning into the worst start to the ski season in a long time. 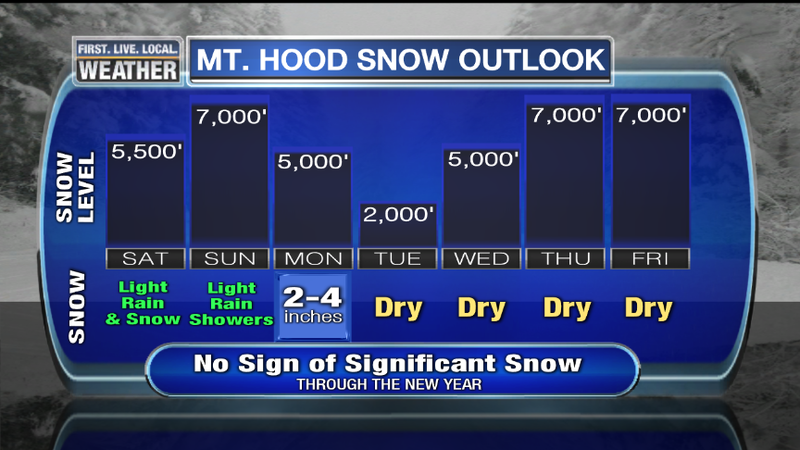 Many years we see a sudden turnaround with a bunch of snow sometime after mid-December. But this winter there is no sign of improvement on the horizon. That would be about 10 days out right now. In patterns like this (stable with a strong upper level ridge), we can look out farther with a bit more confidence than when the jet stream is flipping around all over the place. As a result, it’s unlikely ski areas that haven’t opened yet (Willamette Pass, Hoodoo, Skibowl, Cooper Spur, & Summit) will be able to open during the Christmas Break. I don’t remember the last time we’ve seen that happen. Ski area operators depend on the two-week Christmas Break for a good chunk of their income each year; that’s because kids are out of school and many families take time to go stay up in the beautiful Cascades. The good news for YOU is that it’s still beautiful up there of course. If I had reservations for a mountain resort I sure wouldn’t change them! There is still snow up there, just not the quality and terrain you would normally see. And I see some discounted lift tickets too. Not good eh? This weekend is a bit iffy because the snow level remains quite high. Normally I would think “rain-out”. But the precipitation looks quite light, and specifically Mt. Hood Meadows is on the SE-E side of the mountain. So sometimes in this westerly flow they can stay out of some of the precip. We’ll see. Hopefully nothing falls Sunday because it’ll be well above freezing up there. And we definitely don’t want a bunch of rain with such a thin base. We get a cold front later Monday for some fresh stuff, but not much. Then it’s on to ridging through the end of the week. 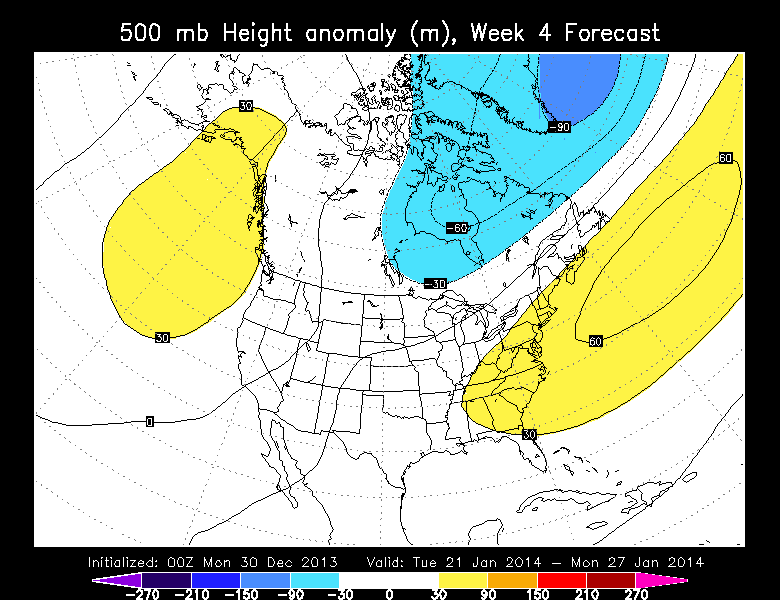 Models have a very weak system about 7 days from now (Friday/Saturday), then another round of ridging for a few days. I’ll be on vacation for a couple days so no posts through early next week. I will probably post-Christmas evening when I work again. You won’t be missing anything since the weather looks real slow for about a week. The light precipitation has arrived, and it’s doing just about what we expected. Flakes or ice pellets in the air, sticking lightly in some spots, but not in others. As I mentioned in the first couple sentences of last night’s post, it may end up being just a “talker” as we say in the business. I first saw the term “conversational snow” a few months ago and I’ve decided it’s a perfect weather phrase. It means enough snow for folks to notice and admire, but not enough to have a significant effect on roads or your life. Just enough to blare the Christmas music in your car as the flurries zip by at 65 mph while you spread butter on the bagel, fix your hair, and sip your coffee. I have white ground here at home, that’s just since 7am. Many areas in the main part of the metro area have seen nothing sticking to the ground though. There has been less than expected up in Clark county. Looks like 1/2″ at best so far north of Vancouver. I still think the Battle Ground to Amboy areas have the best chance of getting 1″ or so before it’s over. Also watch out for freezing rain in a few protected valleys in the Coast Range or Cascade foothills. It’s real straightforward; if your road is wet, it’s not going to freeze now. But if it is snow-covered a layer of ice may form over the top of that before 10am if your local temperature is below freezing. Models have clearly shown a back edge to the solid precipitation and that may be what’s coming over the Coast Range right now. Big Picture: As expected, we escaped a significant snowfall and by 9am the upper atmosphere will warm too much to support snow anyway. Then it’s on to gusty southwest wind this afternoon. Probably the strongest southerly wind we’ve seen in about 3 weeks. Maybe 30-35 mph gusts. 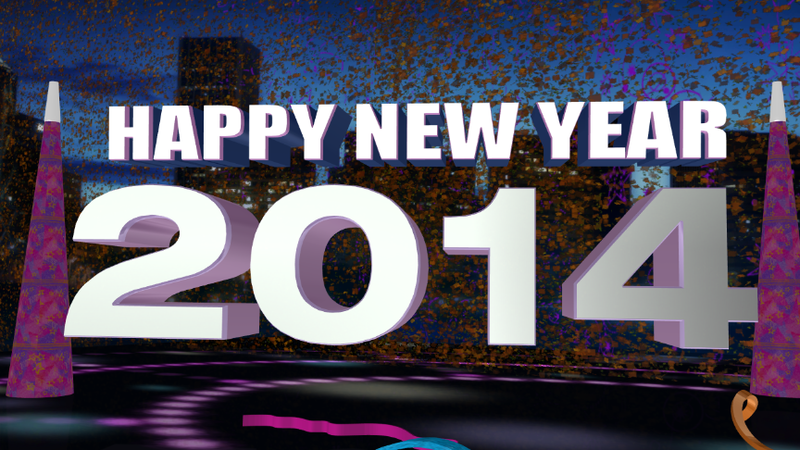 You are currently browsing the FOX 12 Weather Blog blog archives for December, 2013.